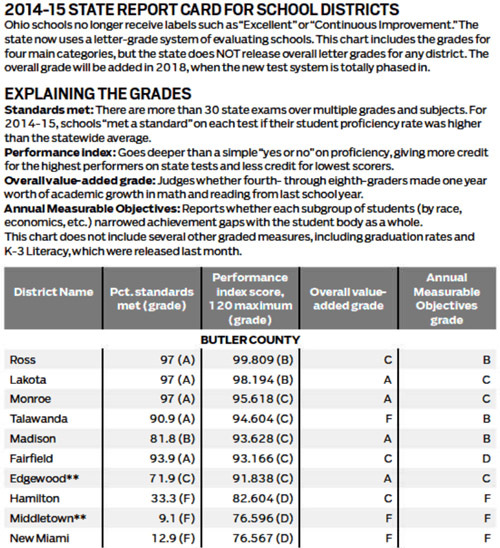 Middletown, Hamilton schools received low marks in the latest annual state report card. Middletown and Hamilton schools earned some of the lowest grades in the latest Ohio Department of Education annual report card released today. The state report, which was delayed this school year from its usual August release, looked at a number of academic areas for each of Ohio’s 613 public school districts. Today, the state of Ohio the state have announced how proficient schools were on tests and have listed their performance index numbers, which adds credit for very high scores and penalizes very low scores. Lakota Schools scored among the highest of Butler County’s school systems as did Mason Schools in Warren County. Nearly 99 percent of Ohio students took state tests last year. Even with the vast majority of student participation, the department of education will show district Performance Index grades with and without students who participated in state tests. Last summer, Ohio lawmakers passed a provision calling for a “safe harbor” to give students and schools time to adjust to the new standards and tests. During this safe harbor, districts will not include student progress as part of teacher evaluations unless districts and teachers agree to use the data. Schools also will not use student test scores to hold students back, except for meeting high school graduation requirements and scores on the state’s third grade reading test. State results for the Third Grade Reading Guarantee will be released in the coming months, as in the past. Check back to the Journal-News later this afternoon for more on this story. Better yet, how about Sam Ison explaining why this happened. How about Lolli? She seems to be a major kingpin in your schools. The continued yearly, post proficiency results supply of excuses has just about been exhausted I would think. Let's see, we've heard a lack of levy money is the culprit. The latest copies of the books are not available. We need new schools to improve performance. We are a low income community and the kids don't come to school prepared to learn. We are trying a new program of learning that we believe will, no doubt, show promising results when implemented. The kids are hungry for breakfast and lunch so we need to feed all of them for them to learn. We need the parents to participate more. We need more parents to show up on parent/teacher conference night. Our hands are tied in dealing with disruptive students and the rest of the students who want to learn are penalized for it. We have a barrier between the teachers and the administration that inhibits the learning process at times. We are losing the experienced teachers and have only first year teachers to chose from who are joining our staff. We have a high rate of resignations in our district and there is no continuity in our teaching staff. We can't afford to pay what the more affluent districts pay. That about cover it as to the excuses used the last ten years or so as to why the district just keeps tripping over itself toward making any progress at all on proficiencies or indicators? The "Board of Directors", (the taxpayers), want to hear some reasons as to why we are not getting a return on our monetary investment in this district. Ison, administrators, you all are getting paid the big bucks to fix this very thing. It is your job. You accepted it under the current terms. Why have we been through all the superintendents we have had here the last two decades and still, nothing is improving? Why? What took precedent over it all, was passing the school building levy. The rubbage it was the first step in rebuilding Middletown. The city and the school district really care about passing levies and creation of the mirage, the right track has been found. Memo to residents. Your school district will be stuck on CI, going nowhere, for years. Same with the city. BTW, when tax revenues have been flat for 20 years, why would the 2020 be remotely possible, with such an increase, based upon the past? Someday, although doubtful, some may open their mind to mindless falsehoods that are stated with such disregard that the individual can think, and be outraged. When that day arrives, and only if it does, the city will change for the better. Meanwhile, Butler County’s two urban districts, Hamilton and Middletown, earned some of the lowest grades in the area. Hamilton scored an F in Indicators Met and a D in Performance Index and Middletown graded F and D, respectively. Middletown released the following statement late Thursday night: “As a school system, we at Middletown City School district recognize the need for improvement in all areas. We are thankful to see progress in some of our buildings on the value added and GAP grades. We will continue to remain focused on literacy throughout the district and are exploring ways to prepare our students on the retention of information over the summer. Calls to Hamilton seeking comment were not returned to the Journal-News. Here is how other Butler County districts scored in the two indicators: Madison A and B; Edgewood C and C; Monroe A and C; Fairfield A and B and Lakota A and B.
Warren County district scores: Carlisle B and C; Franklin B and C; Lebanon A and B; Springboro A and B; and Mason A and B. This is a .5 GPA. If I were in college, this would be flunk out notice, and my father kicking my a++ so hard, and my allowance, I'd have filed for Chapter 11 and never walked again. DISGRACEFUL MCSD. "Middletown released the following statement late Thursday night: “As a school system, we at Middletown City School district recognize the need for improvement in all areas. We are thankful to see progress in some of our buildings on the value added and GAP grades. We will continue to remain focused on literacy throughout the district and are exploring ways to prepare our students on the retention of information over the summer. “We are not happy with the grades Middletown City School District has received for the 2014-15 school year. We will continue to grow and improve. As a district, we recognize we have a lot of work to do.”"
Nope, Not this time MCSD. The excuses are too repetitive and the passification responses are no longer acceptable. We have pulled the ring in your neck now for a decade when the performance is abysmal. The message is always the same. The next year's results are always the same......failure in all facets of your educational effort. If you academic/school board people had a conscience, and if you people actually cared as much as you say you do, this wouldn't be happened on a recurring basis. The failures never change, so much so, that they are now considered the norm and we now expect the pathetic results to continue with a "what else is new" attitude. It is a sad situation when the people of a community have nothing to look forward to from their school district but failure. If you cared, major changes would be happening but it looks as if it will be business as usual with failure as usual to follow. Apparently, failure is all you can be to quote the Army slogan. Don't have the gall to ask for more money after this fiasco. We won't pay for this pathetic effort. This represents another element of distressing news that our top municipal government managers fail to consider or ignore in their totally irrational pontifications about 2020, etc. Stop the baloney! Your rah-rah cheerleading is baseless and insulting! I believe Analytical I read you were or are a leader in real estate. Yesterday, City Manager Adkins stated as part of his math formula for 2020 tax revenues, 425 new families would move into the city making $40,000. annually. That number is within a few thousand dollars of the federal poverty level for a family of four, and close to section 8 benefits. Analytical, I doubt a family of 4 making $40,000 a year, would qualify for a house loan, and could not afford a home of more than $65,000. It is this type of demographic City Manager referenced in 2020, and their income level, that is driving school performance down so poorly. Someone get a clue will you, and throw the speakeasy plans and rhetoric into a nearby trash can. 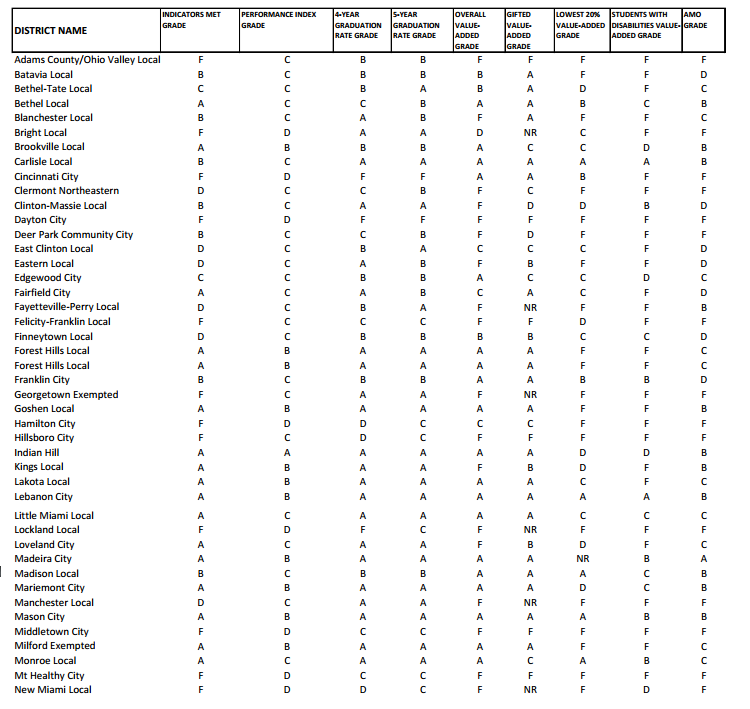 **Districts that have appealed their value-added data. The state expects to resolve appeals in March. this rating should have been expected--what has REALLY changed around here? as long as Hamilton and Middietown hold their current demographics, and our govt(at all levels) continues to reward the un-educated(poorly educated as the Donald calls them) and 2nd/3rd generation govt assisted to a level slightly above the "working poor", there is no real incentive to work towards a meaningful education and career. Let's get real---there is a serious difference in climate between Hamiltucky/Middletucky and West Chester/Mason,Sycamore. I spent my working life in the trenches of this community. I experienced our level of education/career daily. And I travel a lot outside our city limits to other prospering communities. Need I explain the differences? Will new school buildings change things overnight? Absolutely not. But they may well change things over time, as our demographics hopefully change. Ms.Andrews? I want to hear ideas/comments from our NEW school board members--time for them to weigh in. At least Ms.A had the decency to participate here. Nothing so far from our new members, OR new Council members(who were visible here when seeking election). A good education is available here if a student wants it. It all comes down to raising and preparing children for a contributing future, from birth throughout adult life. We are all constantly learning and able to improve ourselves. Teachers and admin can only do so much. I hope that the system begins to hold students(AND their parents) accountable from day 1 upon entering school. How else can we raise ourselves? The Ohio Department of Education released new state report cards Thursday. The grades are based on state tests for the 2014-1015 school year - the first year Ohio measured students through new Common Core standards and PARCC test. The rating should not have been unexpected? You aren't serious are you? Citizens just spent $150 Mm on school buildings that students don't appreciate nor are making an effort to perform, and the taxpayer should be pleased. I have moved 10 times in my career, and not once have I ever met a realtor the first comment about a community was the reputation of the school district, you know, location, location, location. Get real, do you think anyone would move into a city with high taxes already on a property, especially in Bulter Cty with all the attached taxes for everything under the sun, and new school buildings, and we should be pleased with horrible performance? Do you honestly think a business or a resident would want to move in, when the greatest fear and economic analysis, would be do I pay $5,000 on taxes, and $8,000 to send my kid to Fenwick or a private school. Doug Adkins vision of 2020 just got knocked off having any chance for success. New residents don't move into an area having failing schools, and where taxes are already high from mentally ill levies, senior citizen levies, new school building levies. It reaches a point where even the most ardent cheerleader in Miiddletown sighs and says, "this town isn't worth it." In 2020, not one goal outlined will be reached of any tax revenue growth near $ 4 Million, nor will there be an influx of more houses sold than up for sale. Take that to the bank. just what rating did you expect, and what change were you expecting to see? Despite the rah rah, those honest and involved realize that most things are NOT getting better in Middietown or Hamiltown. Upscale families and young professionals are NOT making a new home in either community. More quality families are quietly LEAVING both communities. I have been on the system finance committee, conduct/discipline/climate committee, treasurer search committee, involved with CBI at the Community Center, worked with athletic programs and am very familiar with teachers admin and board members. May you(and a few others here) need to actually spend some time around the schools, the students, the parents and the staff. Just what exactly do you think that they should be doing that they are not? Every system, staff, student and parent wants the newest and best school facilities for their use. Will the new buildings make a difference?---I hope so in time, however that is just one(albeit costly) piece of the puzzle. I spend time down at the old school on Vail--it really needs to go. I believe in neighborhood schools for early development, but we won't have that. Upon reading the response from the school board and the excuses, and proud to be a Middie, let us be swept away quietly into the good night. It done, history, gone. We didn't fail because we have pride, Middie Pride. Good Lord, what is the Freud term for denial? I remember the discussion with Ms. Andrew on the performance topic. I distinctly remember her mentioning the "Value Added" number as being the most important. According to the chart presented by 409, the Middletown school district received an F for value added. Guess the stance that Ms. Andrew took on that category, as to importance, is a mute point at this time. I see we do have some of the newer school board members responding. Judging by the content of their response, it would appear they have been schooled in the art of denial, blaming all but the district, refusing to address the reality of the situation and basically have acquired a degree in passification with a minor in bs ing the public. They have learned quickly to adopt the tricks and trades of a Middletown School Board member in the art of dazzling the public with meaningless rhetoric. Congratulations new members. You will do well in this school system. Just don't think of joining any that would be competent. You are not alone in this. City Council has a grooming program of their own offering the same amenities. Anyone else notice how well Monroe and Lebanon are doing since they relieved themselves of the dead weight of Libby Lolli and Sam Ison.